Aspartame (NutraSweet, Equal) is a nonnutritive sweetener that is roughly 200 times sweeter than sugar. It is found in many reduced-calorie foods, including diet soft drinks, yogurt, chewing gum, ice cream, ice pops, jellies, jams and breakfast cereals. Aspartame is also available in powder form to be used as a tabletop sweetener. The American Academy of Nutrition and Dietetics, the American Diabetes Association and the U.S. Food and Drug Administration consider aspartame a safe alternative to sugar. Additionally, a number of studies have concluded that aspartame has no significant effect on blood sugar or insulin levels. A few research studies, however, have come to a different conclusion. The effects of aspartame on blood sugar have been studied in both animals in humans. Although some of the animal research suggests that aspartame might elevate blood sugar, the relevance of these findings for humans is unclear. For example, a study published in the October 2014 issue of "Nature" found that lean mice fed aspartame for 11 weeks developed high blood sugar levels. The researchers speculate that artificial sweeteners like aspartame can alter healthy gut bacteria, enhancing the transport of sugar from the intestines into the body and elevating blood sugar. Another animal study, published in the October 2014 issue of "PLoS ONE," also found that feeding rodents low-dose aspartame affected the healthy gut bacteria. This increased production of propionate -- a chemical that stimulates sugar production -- and elevated blood sugar. Human research, however, tells a different story. For example, a December 2010 "Journal of the American Dietetic Association" review of 11 studies involving more than 2,000 people found that nonnutritive sweeteners like aspartame have no effect on blood sugar in people with type 2 diabetes (T2DM). Likewise, an October 2015 "Archives of Public Health" analysis of 31 clinical trials and 2 reviews also reported that consumption of nonnutritive sweeteners like aspartame for periods of up to 18 weeks do not affect blood sugar in people with or without diabetes. The pancreatic hormone insulin helps regulate the amount of sugar in the blood after meals. The rise in blood sugar after meals relates primarily to the amount of carbohydrates consumed. Because aspartame is carbohydrate-free, it is not expected to effect insulin levels. However, a very small study published in the July 2007 issue of "Diabetes Care" reported otherwise. The researchers studied 14 men with T2DM who were fed breakfast sweetened with aspartame, table sugar or fructose on different days, followed by rigorous exercise. The researchers observed similar increases in insulin levels with both the aspartame- and table sugar-sweetened meals. However, larger studies do not support this finding. For example, a study published in September 1998 in the "American Journal of Clinical Nutrition" involved administration of a large dose of aspartame -- the daily equivalent of about 20 cans of diet soda -- to 48 healthy people without diabetes for 20 days. The researchers found no effect on insulin levels. More recent research on this topic was published in the August 2010 issue of "Appetite." The researchers found the insulin levels of 14 study participants were significantly lower after eating a snack sweetened with aspartame than after a snack sweetened with sugar. Being overweight or obese fuels insulin resistance, the main metabolic abnormality in people with T2DM. Insulin resistance, in turn, drives up both insulin and blood sugar levels. Many people use products sweetened with aspartame instead of sugar in an effort to manage their weight. However, two large studies published in the August 2008 issue of "Obesity" and the March 1986 issue of "Preventive Medicine" found that drinking beverages sweetened with nonnutritive sweeteners like aspartame was associated with weight gain. However, a June 2006 "Nutrition Bulletin" review of 16 studies involving more than 350 people reported that replacing sugar-sweetened foods with aspartame-sweetened foods can help with weight maintenance and even weight loss -- a little less than 1/2 pound per week, on average. Another September 2014 "American Journal of Clinical Nutrition" analysis that pooled results from 24 studies involving more than 100,000 people found that the use of low-calorie sweeteners was associated with modest weight loss. Aspartame was tested and approved for use as a general sweetener by the U.S. Food and Drug Administration in 1981. According to the FDA, the acceptable daily intake, or safe level, is 50 mg per kilogram of body weight. This is the equivalent of about 18 to 20 cans of calorie-free soda per day for a 150-pound adult. 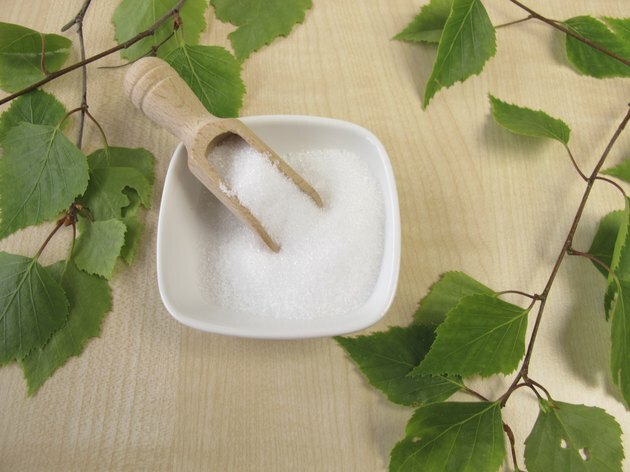 Recommendations by the American Heart Association and the American Diabetes Association, published in the August 2012 issue of "Diabetes Care," suggest that moderate use of nonnutritive sweeteners like aspartame could have a positive effect on insulin and blood sugar by aiding weight control. However, the authors note that this will be the case only if calories are not increased elsewhere in the diet. It is also important to keep in mind that many foods containing aspartame still provide calories and carbohydrate from other ingredients, even though they may be labeled "sugar-free." Finally, aspartame should not be consumed by people with phenylketonuria -- a rare genetic condition in which the body cannot properly metabolize phenylalanine, which is a component of aspartame. Diabetes Care: Is Aspartame Really Safer in Reducing the Risk of Hypoglycemia During Exercise in Patients With Type 2 Diabetes?